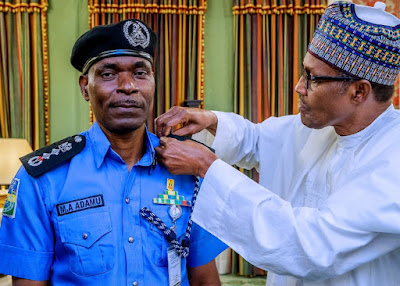 The new DIGs who were elevated from assistant inspectors-general are Usman Tilli Abubakar, who joined the police from Kebbi State in February 1986; Abdulmaji Ali, who joined the police from Niger State in February 1986; Taiwo Frederick Lakanu, who joined the police from Lagos State in February 1986 and Godwin Nwobodo, who joined the police from Enugu State in 1984. In addition, The remaining two new DIGs who were elevated from the rank of police commissioners are: Ogbizi Michael, former Abia State police commissioner, and Ibrahim Lamorde, a former chairman of the Economic and Financial Crimes Commission who hails from Adamawa State. Mr Lakanu was the Force Secretary until his appointment. The new DiGs were named on Monday morning, police sources said. Their respective portfolios would be announced later on Monday by the Police Service Commission. Their elevation comes a day after Mr Adamu retired seven DIGs who were his senior in order to pave way for the constitution of a new management team with whom he could work comfortably. PREMIUM TIMES also broke the news of the retirement of the senior officers on Sunday night. In a related development, The affected officers we Maigari Dikko, the DIG in charge of finance and administration and Habila Joshak, the DIG in charge of operations. The seven officers were amongst 15 senior officers PREMIUM TIMES reported were likely to be retired on January 17. In the same vein, Mr Adamu has now followed the tradition, which has been criticised as wasteful and demoralising because of huge resources the nation had spent on the vast knowledge the senior officers had acquired over the years.